Apologies for the long wait from the last post as I've been involved in a three weeks wild goose chase. Every company has a character who presents themselves as an expert while at the same time there are clear signals that they do not know very much on a subject. A customer made an agreement with one of this experts which was nicknamed Nyohkee. I don't know very much about this guy, he can be the Greatest American Hero for all I know. After attending his presentation which was full of colorful slides and catchy phrases such as "You have to spend money to make money" he came to my desk with a song and dance that there was the opportunity to attract new customers. My first thought was to blow this Popsicle stand as I had a feeling that the discussion was not going to go anywhere but the customer recommended to support any request even if the solution does not meet the potential client needs. End of discussion. In the next three weeks, including Sundays, I proceeded on the wild goose chase constantly feeling the pressure from Nyohkee. The morning before the presentation an announcement was made that the client meeting was cancelled. Now it is time to introduce the next episode. 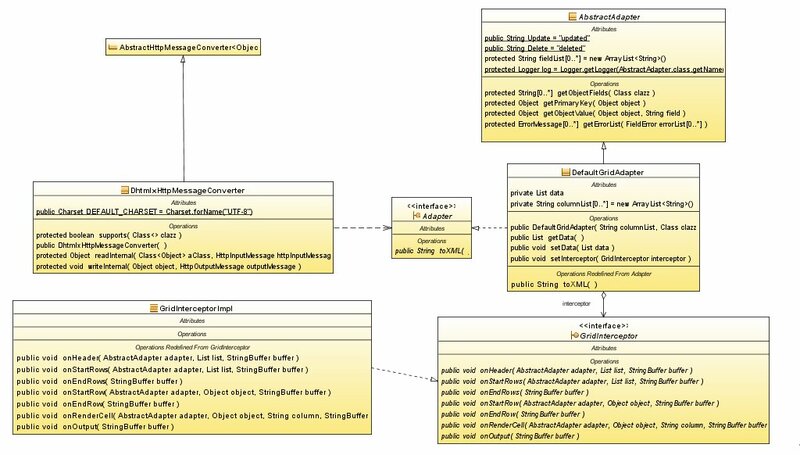 This post introduce another feature of the DHTMLX Spring Adapter which provides a server side programming model using one of the nicest feature of the DHTMLX library: the ability to create the components using an XML representation. This feature gives the ability to package your components in JAR files and reused simply including them in your web application library folder. The project has been formally renamed to DHTMLX Spring Link and it is available on Google Code at: https://code.google.com/p/dhtmlx-spring-link. In the picture below you will find the DHTMLX Spring Adapter class diagram for the dhtmlxGrid component. Each adapter implements the Adapter interface, which consists of the single method toXML. The AbstractAdapter class, is the base class of all the adapters and encapsulates the methods common to all the subclasses. The DhtmlxHttpMessageConveter, is the class which integrates the adapters with the Spring framework. Below the code of the message converter. The supports method detects whether the given class is supported by the converter. In this case the class must implement the Adapter interface. When a class is supported, the HttpMessageConverter invokes the writeInternal method to write the object to the Http response body. The writeInternal method of the DhtmlxHttpMessageConverter obtains the representation of the object in XML, invoking the toXML method of the Adapter interface. 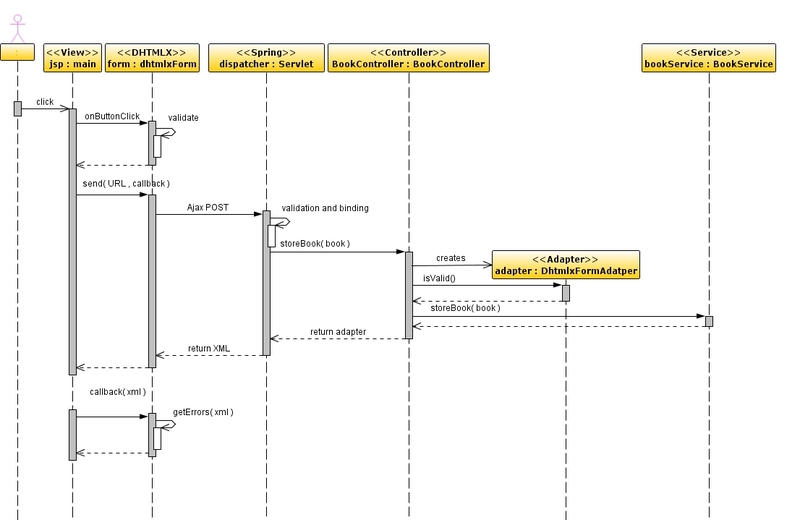 In the example below, the BookController class returns an instance of the DefaultGridAdapter to the DhtmlxHttpMessageConverter. Another important element is the @ResponseBody which indicates that the return type of a controller method should be written to the HTTP response body, and not placed in a Model, or interpreted as a view name as standard behavior of Spring MVC. The DefaulGridAdapter is a basic adapter for the dhtmlxGrid component. The grid adapter constructor accepts as parameters a string containing the attributes to render, and the class of the object. The setData method allows to set the collection of data. The toXML method invokes the interceptor which contains the logic for the XML generation. Below the default implementation of the GridInteceptor. It is possible to write a custom GridIntercepter and set it via the setInterceptor method. For example to highlight the rows of the grid which match a condition, it is possible extending the DefaultGridInterceptor and overriding the onStartRow method. The code example below highlights in red the books with a price greater than 10. The same concept applies to the header (onHeader), to a single cell (onRenderCell) and to the end of the XML processing (onOutput). For more information about the grid XML format refer to DHTMLX documentation. The DefaulFormAdapter is a basic adapter for the dhtmlxForm component. The adapter supports the basic operation: read, write and delete. The form adapter toXML method generates the appropriate XML message depending on the operation. The toDataXML returns the XML for the load method of the dhtmlxForm, toStoreXML and toErrorXML handle the send method. Below an example of the BookController using the form adapter. The getBook method implements the read operation, while storeBook creates or updates the object. The DefaultFormAdapter constructor used in the storeBook method takes two parameters: the first one is the model object, the second (BindingResult) holds the result of the validation. When the object contains valid data (hasValidData) the controller can perform write operation to the datastore. While waiting for the next episode, don't forget to join the virtual strike against Internet censorship. In the previous episode the DHTMLX Spring Adatper was introduced, now it is time to take care of the object through validation. The DHTMLX Tag Library, a JSP Tag library created on top of the DHTMLX component framework, allows to create DHTMLX forms with a very similar syntax to Spring JSP form tags. In order to minimize the client to server data exchange, it is a 'user friendly' practice to perform client side validation before sending data to the server. I used the expression 'user friendly' because the client side validation can be easily bypassed. Staring from release 3, Spring has introduced several enhancements to the validation framework, including Bean Validation API (JSR-303). It is possible to declare validation constraints using annotations. 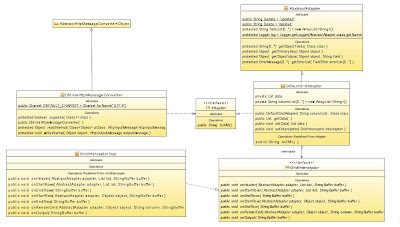 This example has been written to run on the Google App Engine (using JDO). In the Book class below, in addition to the validation, you will find the persistence annotations. A custom constraint annotation BookConstraint has been added to the title attribute, in order to evaluate if the book already exists in the datastore. You can find additional information about writing custom constraint in Spring documentation. After validation the BookController receives an instance of the Book class initialized with the form data and a BindingResult object containing the errors detected. For those who like sequence diagrams see below. In the next episode, the design of the DHTMLX Spring adapter will be presented in detail. For those who can't wait the application, running on the Google App Engine, is available here.